So just what is EPLI (employment practices liability insurance)? EPLI covers businesses against claims by workers that their legal rights as employees of the company have been violated. Today, in this business world, more than ever with the current employment status, Orange County, CA employers, including both small and large companies, have found this to be a necessary part of their insurance package. Over the past few years in the Orange County, CA area, lawsuits filed by employees against their employers have been on a steady rise, and according to reports, will only grow larger in the future. While most EPLI suits are filed against large corporations, in today’s employment climate, no company is immune to such lawsuits. Given that fact, even the smallest of Orange County, CA companies that have employees, including partnerships, corporations, and LLCs, now need this kind of insurance for their Orange County Businesses. Over half of the EPL claims in Orange County, CA are directly linked to employment practices such as wrongful termination, harassment, discrimination and much more. This type of litigation can cripple a company, often draining the company’s profits on legal expenses and settlements. Employment Practices Liability Insurance can provide coverage for claims arising from such things as Title VII of the Civil Rights Act of 1964, The Americans with Disabilities Act, The Age Discrimination in Employment Act, The Equal Pay Act, The Pregnancy Discrimination Act of 1978, The Immigration Reform Control Act of 1986, and The Family and Medical Leave Act of 1993. There is no standard cost of an EPLI Policy since the cost depends on what type of business you are in, the number of employees your company has, and numerous risk factors such as whether your company has been sued or paid claims for employment practices in the past. These Orange County, CA EPLI policies will reimburse your company against the costs of defending a lawsuit in court and for judgments and settlements. The EPLI policy covers legal costs, whether your business wins or loses the suit. EPLI Policies also typically do not pay for punitive damages or civil or criminal fines. 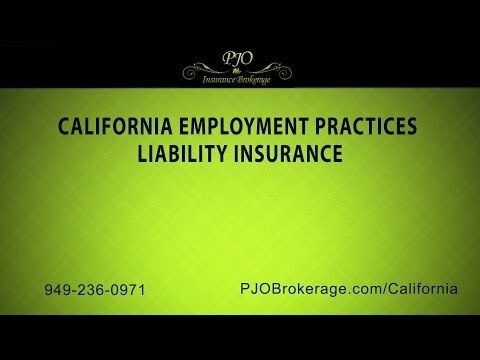 To learn more about EPLI and how it can help your company, please call the experienced and professional brokers at PJO Insurance Brokerage in California, We can work with you to put together the proper coverage for your business.